Wearing the best homecoming hairstyles from the latest looks is vitally important at this semi-formal event. The relaxed dance in the evening is a great way for getting to know new people in a relaxed and friendly atmosphere. So now’s the time to check out the best fashionable homecoming hairstyles for long, medium and short hair to ensure you make the best possible impression! If you’re spending the day outdoors at a sports event, before preparing for an evening dance, this youthful look is perfect! The style has tousled waves that the weather can’t spoil and the lovely, flat, waterfall braid set on one side, keeps the top under control. Neutral beige-brown roots under a gorgeous white blonde shade show you’re totally on trend! Emphasize the pretty V-shaped cut at the back, with a V-shaped waterfall braid above. 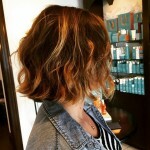 This rich copper hair color idea has lighter copper highlights to accentuate the beautiful cascade of waves. Notice the three different textures – smooth crown, head braid and ringlets! On very long hair, you can combine several stunning hair color ideas and styling options. 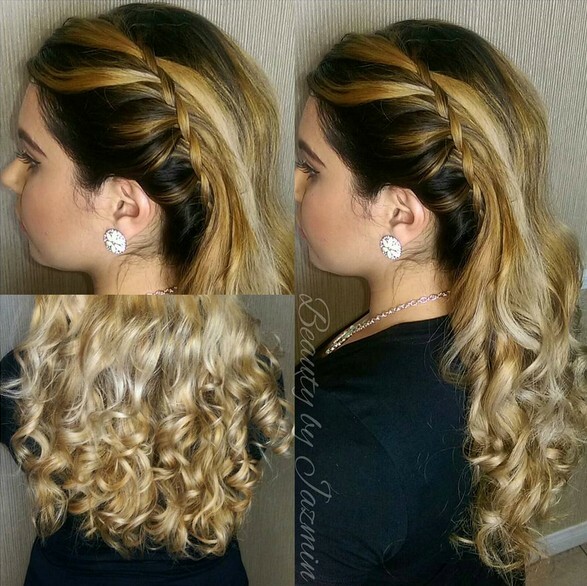 This semi-formal homecoming hairstyle has a very attractive profile showing off a beautiful blend of colors in the waterfall braid. The gold highlights become a lovely white blonde ombré arranged in sumptuous ringlet curls in the lower lengths! 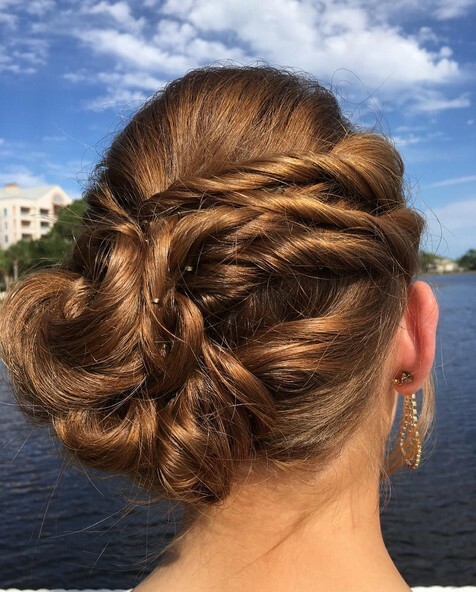 This is a lovely homecoming hairstyle for a semi-formal updo that will keep you cool as you dance the night away. It’s actually a long, loosely braided plait, carefully pinned in looped line from halfway down the head. With sections pulled-out to make the ‘knots’, this easy DIY homecoming hairstyle for long hair looks casual and chic! 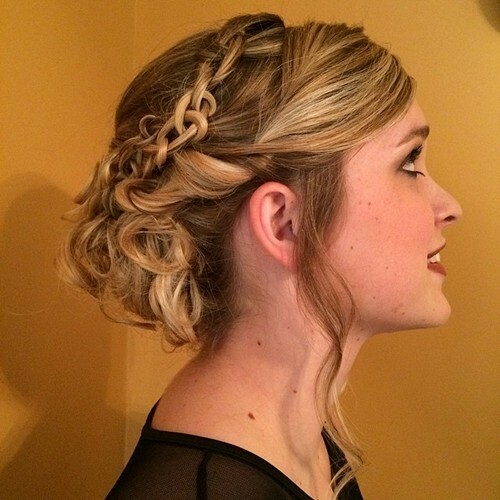 If you like something different, try this beautifully woven homecoming hairstyle for long hair. 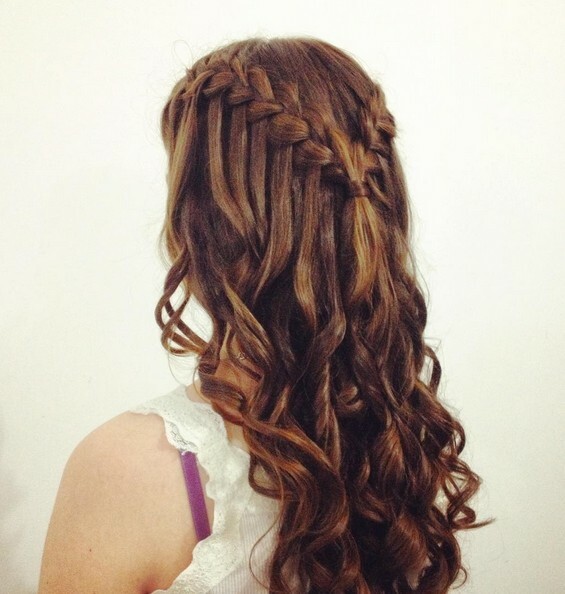 Two parallel head-braids use the waterfall technique to create a lovely, lattice-weave effect on the top and sides. 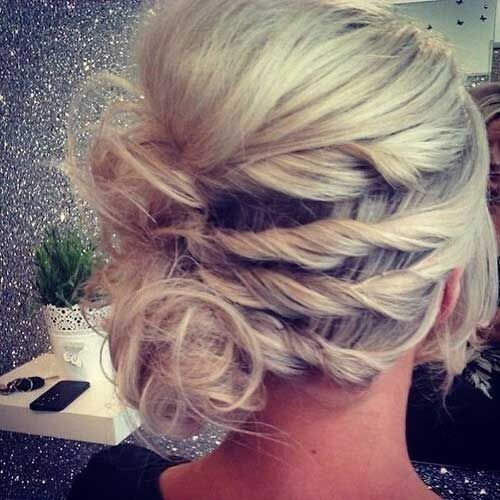 Braided updo’s are the perfect way to show off neutral brown hair color ideas with lots of white-blonde highlights. 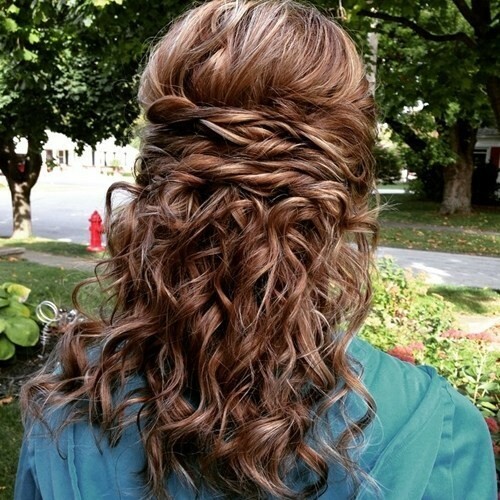 This is another homecoming hairstyle you can do at home, as it doesn’t need to be symmetrical or totally neat. Four sections have been twisted along one side and then pinned into swirls and loops in an asymmetrical position at the back. Leave casually loose strands to complete a fresh and fashionable homecoming updo hairstyle! 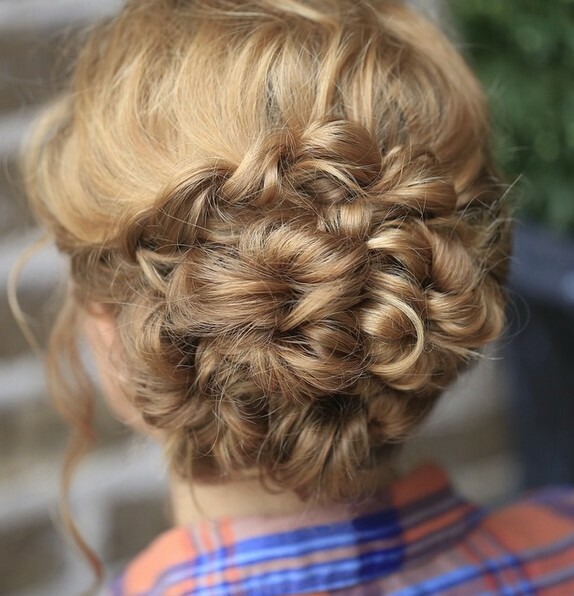 You don’t need long hair to have a trendy homecoming hairstyle/updo on medium hair! The asymmetrical look has hair brushed high over the front, from a side parting, and a loose French twist at the back. This creates a casual, faux Mohawk shape. Twisted side strands complete a very attractive homecoming hairstyle for medium hair! 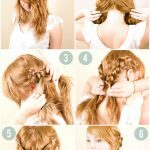 Here’s a simple, but very fashionable way to braid and style long, straight hair for homecoming. Combed back from the front, there’s a cute little bow of hair just below the crown. Then the ponytail is braided in a loose, thick single braid, which then changes to a fishtail braid lower down! This is another new look that’s perfect for medium hair homecoming hairstyles with a difference! The top’s styled in loose, highly defined curls over lower lengths curled under at collar-length. With one side combed back to show the profile, this gorgeous asymmetrical style is perfect for beige-brown hair color ideas with golden-blonde highlights! There’s no sign of romantic braided hairstyles becoming less popular hairstyles this year! And that’s because there’s always a new batch of braiding ideas to keep the look fresh. 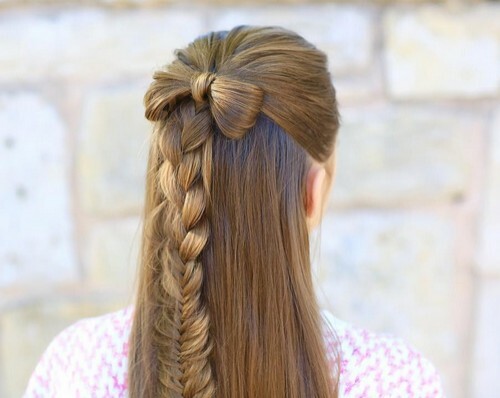 This style mixes two braiding techniques, on thin and neat and the other loose and luxurious with long casual waves and cute side-strands. Thick and wavy long hair looks fabulous with golden blonde highlights to give a 3-D color effect that makes hair seem even thicker! Fine highlights look fabulous in this braided, asymmetrical style in which the highlights are increased to create a rich copper ombré effect in the lower lengths. This is a more sophisticated semi-formal look with a teased crown adding height on top. This is encircled with a pretty braid that overlaps for a double textured feature at the back. 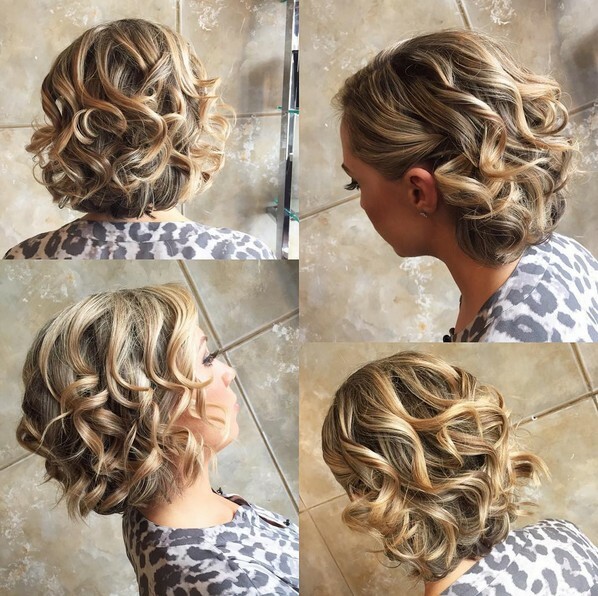 The cascading curls are exaggerated with light blonde highlights creating the fashionable 3-D effect that really draws attention to this homecoming hairdo! 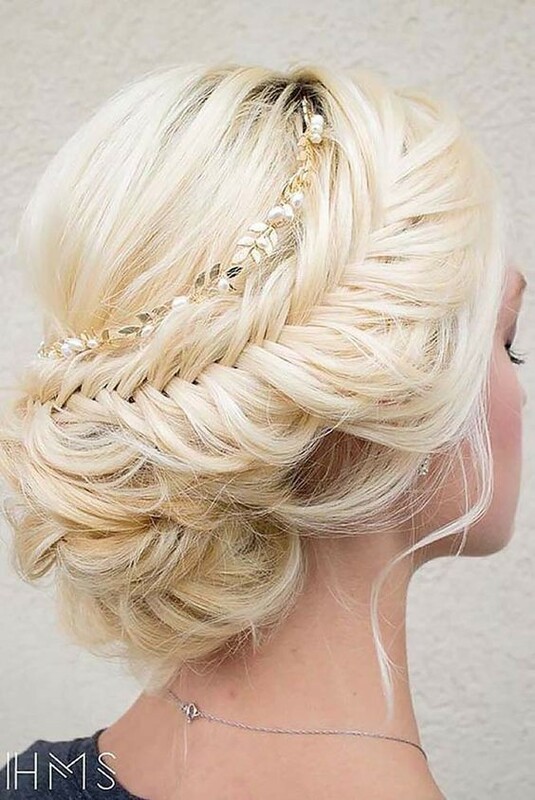 Why not arrive already looking like the homecoming queen, with this amazing pale-blonde regal hairstyle! It’s a casual updo with a loosely in-plaited braid around the head and a small tousled knot at the back. Top-off your homecoming hairstyle with a pretty hair accessory like this gold and pearl circlet and look like a million dollars! 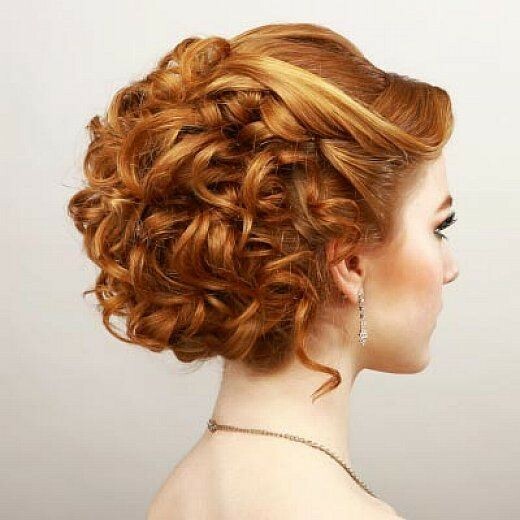 This is another attractive version of the twisted side, asymmetrical updo for proms or homecoming hairstyles. Four separate strands decorate one profile and back whilst contrasting the pale blonde hair with darker roots. There’s extra height at the crown and those gorgeous puffy, knot-buns are so fresh and pretty! Oooh! I love this ‘necklace chain’ braiding around the crown – it’s totally new! And the trendy ideas continue in the carefully twisted side-section, from side-swept bangs. Decorating the nape is a very cute, curly, tousled chignon and casual side-strands finish off a fabulous semi-formal homecoming hairstyle! Instead of a braid circling the head, try this rolled-over hair circle to add texture and shape to a long, wavy homecoming hairstyle for medium or long hair. This hair color idea’s a subtle blend of brown roots with dark-blonde highlights to really accentuate the lively movement in the wavy back section. 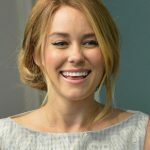 The hair is given a little extra height around the crown, making this a good look to lengthen a round or wide face shape. The side-sections are lightly braided to create an amazing color and texture combination at the back. Then the back is arranged in tousled, beachy waves for a relaxed and youthful finish! Hair with highlights really deserves some wavy texture to get the full 3-D hair color effect that makes hair look thicker and ultra-modern. 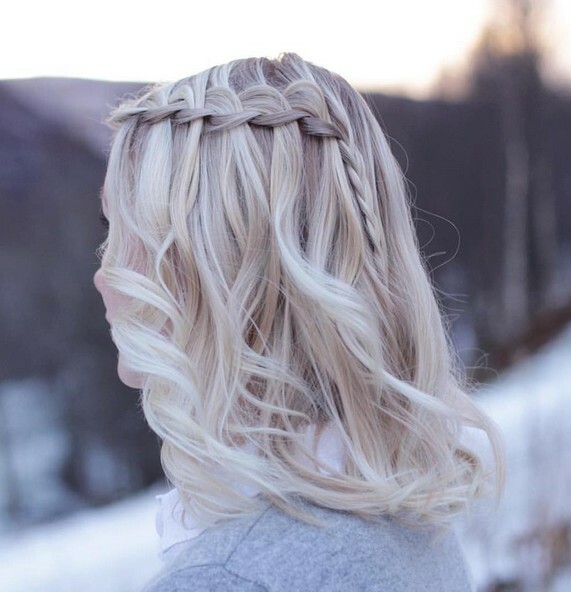 This casual look gains a pretty party feature from the cleverly placed asymmetrical waterfall braid moving around the head! This is another fantastic new updo that’s a contemporary take on the French twist chignon! On blonde hair with darker roots, the defined side sections create lots of texture and patterning. Then the bumpy looped contours of the asymmetrical French twist add even more edge to this unique, up-to-the-minute look! For more sophistication try this black and white contrasted half up homecoming hairstyle for long hair. The crown has a little teasing to add height, and the side-swept bangs are twisted just once at the side before being fastened at the back. Then the loose, thick, defined waves create a gorgeous black/white pattern at the back! 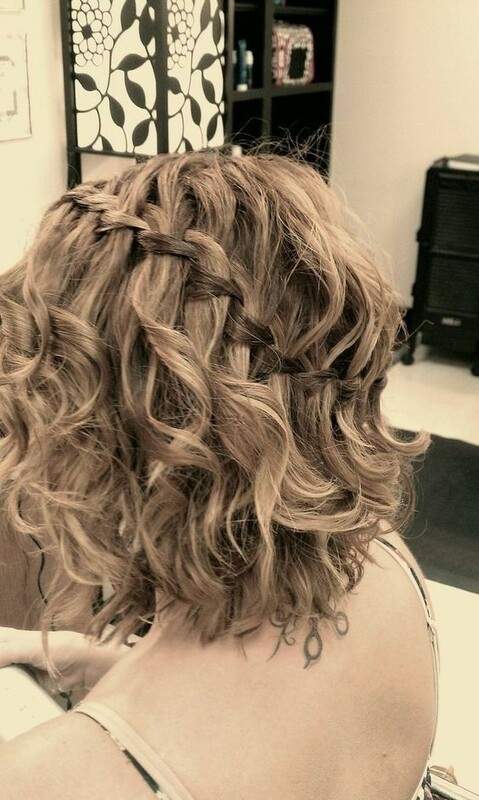 This slightly more formal homecoming hairstyle can be achieved on medium-length, curly hair. From an off-center parting at the front, there’s a lovely soft looped twist moving around to the side and back. Then the rest of the hair is arranged in pretty, defined copper curls that let you show off the beautiful color and texture! So whether you’re looking for a prom, party, wedding or homecoming hairstyle, these are the freshest casual updo’s and half-ups right now! 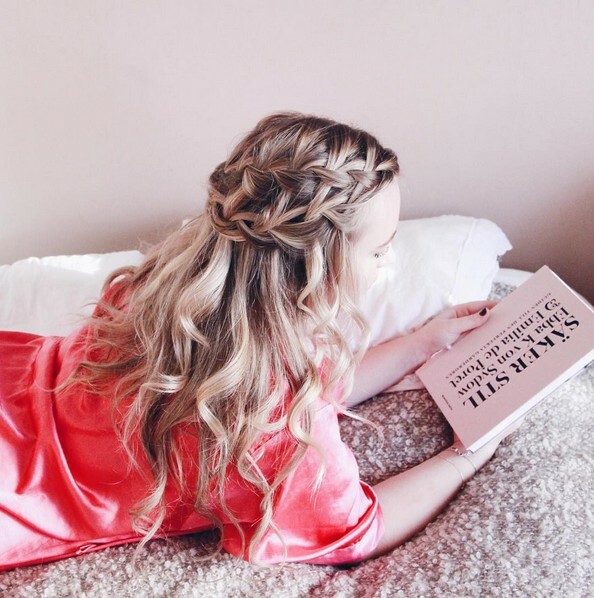 Do you love these braided hairstyles? 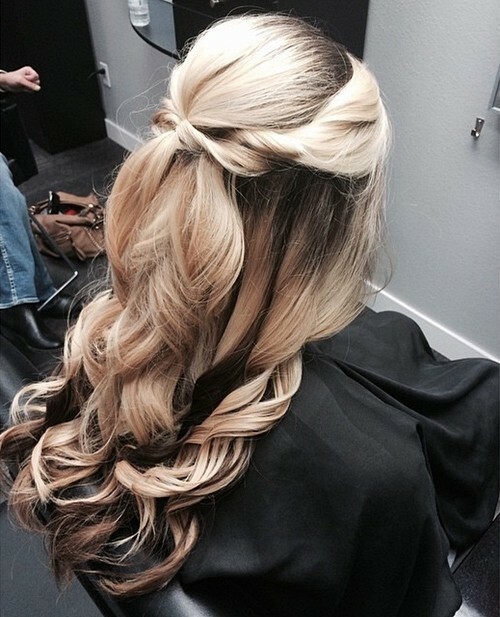 Follow us to get more new hairstyles on hairstylesweekly!